Historical version for the period November 1, 2005 to December 7, 2005. “working space” means any space where persons are engaged in the performance of work within a foundry but does not include offices, lunch rooms, locker rooms, change rooms, rest rooms, washrooms, shower rooms, toilet rooms, pattern shops, maintenance shops, laboratories, shipping areas, the storage space occupied by equipment or materials not regularly in use or the enclosed space where core sands and moulding sands are stored. R.R.O. 1990, Reg. 851, s. 1; O. Reg. 516/92, s. 1. (e) fourteen years of age in a workplace other than a factory. (d) is in an area of the industrial establishment to which the public generally has access. R.R.O. 1990, Reg. 851, s. 4. (g) the name and address of the physician or surgeon, if any, by whom the person was or is being attended for the injury. (j) the steps taken to prevent a recurrence. (c) the name and address of the injured person. 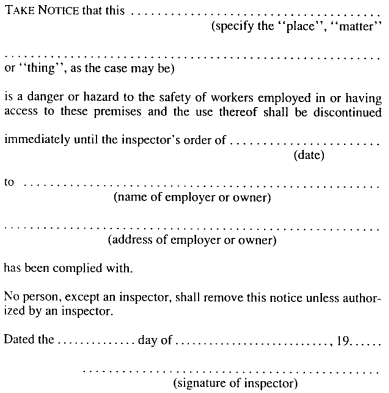 (4) A record kept as prescribed by subsection (3) for the inspection of an inspector shall be notice to the Director. R.R.O. 1990, Reg. 851, s. 5. (b) such longer period as is necessary to ensure that at least the two most recent reports or records are kept. R.R.O. 1990, Reg. 851, s. 6. “Table” means the Table to this section. O. Reg. 528/00, s. 2. A process uses or produces a substance that may result in the exposure of a worker in excess of any occupational exposure limit set out in Regulation 833, 835, 836, 837, 839, 840, 841, 842, 843, 844, 845 or 846 of the Revised Regulations of Ontario, 1990 or in Ontario Regulation 278/05. O. Reg. 528/00, s. 2; O. Reg. 280/05, s. 1. 10. A notice under subsection 57 (9) of the Act shall be in Form 2. R.R.O. 1990, Reg. 851, s. 10. (ii) maintenance of vehicles or similar equipment. R.R.O. 1990, Reg. 851, s. 13. (2) A guardrail shall be constructed to meet the structural requirements for guards as set out in the Building Code. R.R.O. 1990, Reg. 851, s. 14. (f) have rungs which are at least fifteen centimetres from the wall and spaced at regular intervals. (2) Subsection (1) does not apply to an access ladder on a tower, water tank, chimney or similar structure which has a safety device which will provide protection should a worker using the ladder fall. R.R.O. 1990, Reg. 851, s. 18. (C) having natural ventilation to the outdoors by upper and lower exterior wall gravity louvres. (ii) a spark resistant floor. (b) in a metal cabinet of double walled construction with a 3-point door latch and a liquid-tight door sill raised at least fifty millimetres above the floor. (b) containers and dispensing equipment bonded and grounded when flammable liquid is dispensed. R.R.O. 1990, Reg. 851, s. 22. (l) not be used in an atmosphere containing flammable vapours, gases or dusts. (2) Clauses (1) (e) and (f) do not apply to an explosive actuated fastening tool if the velocity of the stud or other fastener does not exceed ninety metres per second measured at a distance of two metres from the muzzle end of the tool when propelled by the maximum commercially available explosive load that the tool is chambered to accept. (3) A misfired cartridge that has been removed from an explosive actuated fastening tool shall be placed in a water filled container until the cartridge may be properly disposed of after its safe removal from the industrial establishment. R.R.O. 1990, Reg. 851, s. 36. (ii) the Electrical Safety Authority, as defined in the Electricity Act, 1998. R.R.O. 1990, Reg. 851, s. 40; O. Reg. 144/99, s. 2. 42. (1) The power supply to electrical installations, equipment or conductors shall be disconnected, locked out of service and tagged before any work is done, and while it is being done, on or near live exposed parts of the installations, equipment or conductors. (2) Before beginning the work, each worker shall determine if the requirements of subsection (1) have been complied with. (4) If locking out is not required for the reason set out in clause (3) (b), the employer shall ensure that the procedures required by that clause are carried out. (5) If more than one worker is involved in the work referred to in subsection (1), the worker who disconnected and locked out the power supply shall communicate the purpose and status of the disconnecting and locking out. (f) shall show the date on which the switch was disconnected and locked out. 42.1 (1) This section applies and section 42 does not apply if it is not practical to disconnect electrical installations, equipment or conductors from the power supply before working on, or near, live exposed parts of the installations, equipment or conductors. (2) The worker shall use rubber gloves, mats, shields and other protective equipment and procedures adequate to ensure protection from electrical shock and burns while performing the work. (3) If the installation, equipment or conductor is operating at a nominal voltage of 300 volts or more, a suitably equipped competent person who is able to recognize the hazards and perform rescue operations, including artificial respiration, shall be available and able to see the worker who is performing the work. (b) the Ontario Hydro Corporate Safety Rules and Policies, dated 1994. O. Reg. 630/94, s. 1; O. Reg. 144/99, s. 3. 44. (1) Cord-connected electrical equipment and tools shall have a casing that is adequately grounded. (2) Subsection (1) does not apply to cord-connected electrical equipment or tools that are adequately double-insulated and whose insulated casing shows no evidence of cracks or defects. (3) Subsection (1) does not apply to a portable electrical generator in which the equipment is not exposed to an external electric power source if the casings of portable electrical tools connected to the generator are bonded to a non-current-carrying part of the generator. O. Reg. 630/94, s. 2. (c) at least one other worker equipped with a suitable alarm and capable of rendering any necessary assistance is keeping watch nearby. R.R.O. 1990, Reg. 851, s. 50. (c) where circumstances may make such contents and direction of flow doubtful. (2) Subsection (1) does not apply to a piping system in a petro-chemical plant where processing and maintenance are carried out by a competent person under controlled conditions so as to provide for the protection of all workers. R.R.O. 1990, Reg. 851, s. 62. 67. 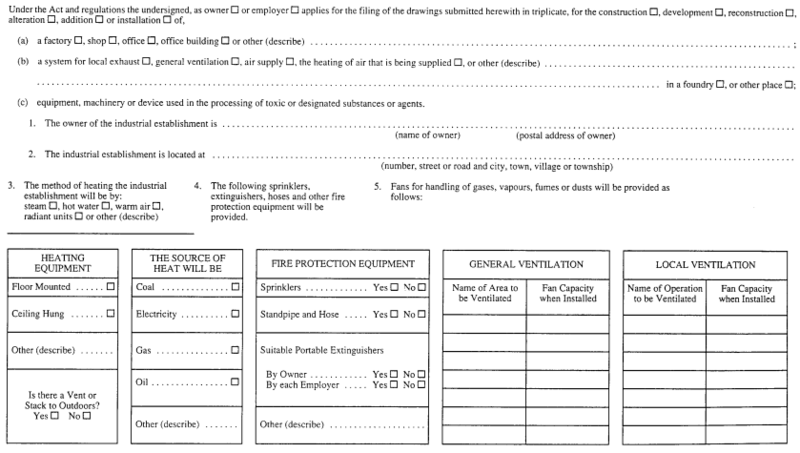 The requirements of sections 68, 69, 70 and 71 apply, with all necessary modifications, to any confined space while a worker is in that space. R.R.O. 1990, Reg. 851, s. 67. (B) will remain free from hazard while any worker is in the confined space having regard to the nature and duration of the work to be performed. R.R.O. 1990, Reg. 851, s. 68. (h) a person adequately trained in artificial respiration is conveniently available. R.R.O. 1990, Reg. 851, s. 69. (g) a person adequately trained in artificial respiration is conveniently available. R.R.O. 1990, Reg. 851, s. 70. (b) the only work to be performed is that of cleaning or inspecting and of such a nature that it does not create any source of ignition. (2) Cold work may be performed in a confined space that contains or is likely to contain an explosive or flammable gas or vapour where the concentration does not, and is not likely to exceed 10 per cent of the lower explosive limit of the gas or vapour. R.R.O. 1990, Reg. 851, s. 71. (b) effective safeguards shall be provided to prevent access to the area. (2) The bracing and shoring or other safeguards prescribed by subsection (1) shall be installed progressively to ensure that a worker installing the bracing and shoring or other safeguards is not in danger. R.R.O. 1990, Reg. 851, s. 72. (c) not be refilled while there is any risk of vaporising or igniting the substance that is being placed in the drum, tank, pipeline or other container. (2) Clauses (1) (a) and (b) do not apply to a pipeline where hot-tapping and boxing-in are carried out by a competent person under controlled conditions so as to provide for the protection of all workers. R.R.O. 1990, Reg. 851, s. 78. 79. A worker required to wear or use any protective clothing, equipment or device shall be instructed and trained in its care and use before wearing the protective clothing, equipment or device. R.R.O. 1990, Reg. 851, s. 79. 81. A worker exposed to eye injury shall wear eye protection appropriate in the circumstances. R.R.O. 1990, Reg. 851, s. 81. (ii) be equipped with a shock absorber or other devices to limit the maximum arresting force to 8.0 kilonewtons to the wearer. R.R.O. 1990, Reg. 851, s. 85. “spillage” refers to the spillage of molten material that could endanger the health or safety of workers. (2) The employer shall use engineering controls, to the fullest extent that is reasonably possible in the circumstances, to prevent spillage. (3) If spillage cannot be prevented by the use of engineering controls alone, the employer shall also develop and implement other measures and procedures to be used in combination with the engineering controls to prevent spillage. (4) If the use of engineering controls is not reasonably possible in the circumstances, the employer shall develop and implement other measures and procedures to prevent spillage. 3. Workers may be exposed to molten material at the location. (2) Egress shall be provided by means of doorways, ramps or stairs of non-combustible material. (3) Egress ramps and stairs shall be made of slip-resistant material. 88. (1) A clear space adequate for safe operating and maintenance purposes shall be provided between the outer shell of any cupola or other melting unit and any wall, structure, equipment or operation. (2) Subject to subsection (5), the width of any passageway or aisle adjacent to a melting unit shall not be less than 1.2 metres. (3) The firing portion and fuel supply controls of each melting unit shall be accessible from an aisle or be in a location remote from a melting unit. (4) Subject to subsection (5), the dimensions of the working space at any melting unit shall not be less than 1.8 metres measured horizontally from the furnace shell or pouring spout or such additional clearance as is required for safe working. (5) Subsections (2) and (4) do not apply to a melting unit installed before the 31st day of July, 1964. R.R.O. 1990, Reg. 851, s. 88. (2) Where a gangway is used for traffic in both directions but molten metal is conveyed in one direction only, the width required by subsection (1) shall be increased by at least ninety centimetres. (3) Where a gangway is used for carrying molten metal in both directions, the width required by subsection (1) shall be doubled. (b) the danger area over which it is transported shall be clear of any worker. R.R.O. 1990, Reg. 851, s. 90. R.R.O. 1990, Reg. 851, s. 91. 96. (1) Subject to subsection (2), the bottom of a cupola shall be supported by one or more adequate metal props with metal bases and wedges supported on concrete or other solid footing. (b) by having the prop or props removed by a winch or similar device operated from outside a wall or shield at the cupola or from another safe location. (3) As soon as is practicable after a cupola is emptied, coke slag and unmelted metal from the dropping of the cupola bottom shall be removed by a mechanical rake or other mechanical means. R.R.O. 1990, Reg. 851, s. 96. 97. (1) Subject to subsection (2), material to be charged into molten metal shall be free from ice or moisture. (2) Subsection (1) does not apply where precautions have been taken to ensure that any resultant reaction will not endanger any worker. R.R.O. 1990, Reg. 851, s. 97. “tree” means a tree that is standing or is down and from which the limbs have not been removed. R.R.O. 1990, Reg. 851, s. 103; O. Reg. 630/94, s. 4. “registered” means registered with the Ministry of Training, Colleges and Universities in order to complete a training program referred to in subsection 105 (1). O. Reg. 488/01, s. 1.
vii. Chipper Operator (Program # P750095). O. Reg. 488/01, s. 1. (2) A document issued by the Ministry of Training, Colleges and Universities, showing that a worker is registered for a training program referred to in subsection (1) or has successfully completed it, is conclusive proof, for the purposes of sections 106, 106.1 and 106.2, of the worker being registered for the program or of his or her successful completion of the program, as the case may be. O. Reg. 488/01, s. 1. (3) In accordance with the Agreement on Internal Trade, 1995 and the Protocols of Amendment, a worker shall be deemed to hold a document showing successful completion referred to in subsection (2) if he or she has successfully completed equivalent training in another province or territory of Canada, as determined by the Director. O. Reg. 488/01, s. 1. (3) Despite subsection (2), the employer shall ensure that every worker employed to work as a cutter or as a skidder operator on May 31, 2002 who has not successfully completed the training required under subsection (1) is registered for the appropriate program by June 3, 2002. O. Reg. 488/01, s. 1. (4) The employer shall ensure that every worker who is registered under subsection (2) or (3) successfully completes the appropriate program within one year after being registered. O. Reg. 488/01, s. 1. (3) Despite subsection (2), the employer shall ensure that every worker employed to operate mechanical harvesting equipment on May 31, 2002 who has not successfully completed the training required under subsection (1) is registered for the appropriate program by June 3, 2002. O. Reg. 488/01, s. 1. (2) Despite subsection (1), the employer shall ensure that every worker employed to supervise the operation of mechanical harvesting equipment on May 31, 2002 who has not successfully completed the training required under subsection (1) successfully completes the program no later than December 31, 2002. O. Reg. 488/01, s. 1. 107. 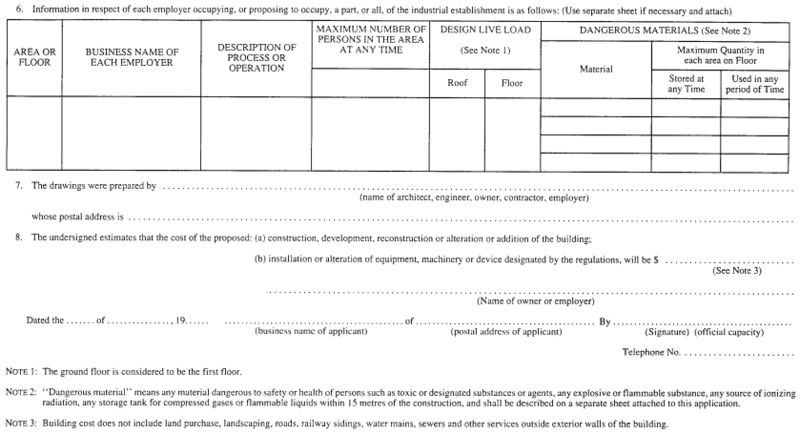 (1) Subject to subsection (2), a felling area shall be kept clear of workers. (b) an inspector or worker accompanying an inspector in the course of their duties. R.R.O. 1990, Reg. 851, s. 107. (b) installed by welding or bolting to the frame of the vehicle. R.R.O. 1990, Reg. 851, s. 114. (ii) have its load released only in compliance with subclause (i). (2) Where a truck or trailer used for hauling logs is equipped with stakes and the stakes are trip stakes, such stakes shall only be located on the right-hand side or rear of the truck or trailer. R.R.O. 1990, Reg. 851, s. 116. (g) the fire protection rating of a closure. R.R.O. 1990, Reg. 851, s. 120. (2) A hazardous room shall be located in a floor area that has at least two exits. (3) A hazardous room shall have at least two egress doorways that are at least three-quarters of the length of the diagonal distance of the room from each other. (4) One egress doorway must be located within a maximum distance of twenty-three metres from any point in a hazardous room. R.R.O. 1990, Reg. 851, s. 122. 123. (1) The requirements of the Fire Code respecting fire extinguishers apply at industrial establishments. (2) The requirements of the Fire Code respecting keeping egress doorways, public corridors and exits free from obstruction apply at industrial establishments. “Fire Code” means Regulation 454 of the Revised Regulations of Ontario, 1990 made under the Fire Marshals Act. R.R.O. 1990, Reg. 851, s. 123. 128. (1) Replacement air shall be provided to replace air exhausted. (iii) not to cause undue drafts. (3) The discharge of air from any exhaust system shall be in such a manner so as to prevent the return of contaminants to any workplace. R.R.O. 1990, Reg. 851, s. 128. (b) not less than 18° Celsius. (f) during the first hour of the main operating shift where process heat provides a substantial portion of building heat. R.R.O. 1990, Reg. 851, s. 129. (c) within 100 metres of any area where work is regularly performed. (2) Subsection (1) does not apply to logging, except in logging camps. R.R.O. 1990, Reg. 851, s. 132. 133. (1) Except for emergency facilities, hot and cold water shall be provided at each shower. (c) be directly mixed with steam. R.R.O. 1990, Reg. 851, s. 133. 138. (1) Where a worker is likely to be exposed to an atmosphere at atmospheric pressure with an oxygen content of less than 18 per cent, the worker shall be protected by mechanical ventilation so that the worker’s safety and health is not endangered. (2) Where the measures prescribed by subsection (1) are not practicable, the worker shall be protected by air supplied breathing equipment so that the worker’s safety and health is not endangered. R.R.O. 1990, Reg. 851, s. 138. “decibel” means decibel measured on a type 2 sound level meter conforming to the standard Z107.1 of the Canadian Standards Association operating on the A-weighting network with slow meter response. (ii) the person shall wear hearing protection. (3) A worker exposed to a sound level of 115 decibels or greater shall wear hearing protection. (4) Clearly visible warning signs shall be posted at the approaches to an area where the sound level is more than ninety decibels. (b) that hearing protection must be worn when the daily exposure is more than that permitted for the particular sound level. (6) Where hearing protection is required by this section, the protection shall be sufficient to reduce the sound level below the sound level in Column 1 of the Table in subsection (5) for the exposure corresponding to that sound level in Column 2 of the Table in subsection (5). R.R.O. 1990, Reg. 851, s. 139. R.R.O. 1990, Reg. 851, Form 1. R.R.O. 1990, Reg. 851, Form 2.